Development of Auditory and Vestibular Systems fourth edition presents a global and synthetic view of the main aspects of the development of the stato-acoustic system. Unique to this volume is the joint discussion of two sensory systems that, although close at the embryological stage, present divergences during development and later reveal conspicuous functional differences at the adult stage. This work covers the development of auditory receptors up to the central auditory system from several animal models, including humans. Coverage of the vestibular system, spanning amphibians to effects of altered gravity during development in different species, offers examples of the diversity and complexity of life at all levels, from genes through anatomical form and function to, ultimately, behavior. 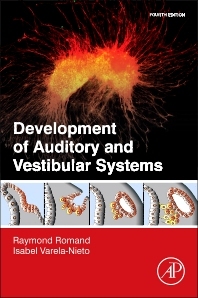 The new edition of Development of Auditory and Vestibular Systems will continue to be an indispensable resource for beginning scientists in this area and experienced researchers alike. 12. How much of the Developmental Regulatory Network is Conserved in Vertebrate Hair Cells?